Ah, lighthouses - beacons that not only have saved countless lives, but have entranced millions with their purpose, shape, and hope. Wherever we travel, we try to see lighthouses. We've even stayed at the lighthouse B&B in Two Harbors, Minnesota! So it was with great joy that we received a review copy of The American Lighthouse Cookbook: The Best Recipes and Stories from America's Shorelines, by Becky Sue Epstein and Ed Jackson. And it's a treasure - packed with over 300 delicious recipes (of course, menus that include plenty of seafood). 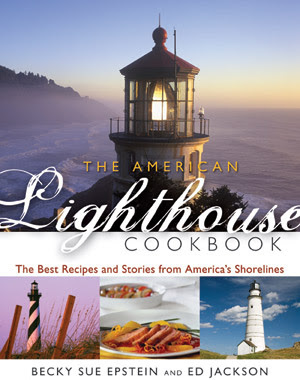 In this wonderful cookbook, Epstein and Jackson visit lighthouses all over the US - 47 of them! Separated into eight different regions - Northeast Atlantic, Mid-Atlantic, Southeast Atlantic, Puerto Rico and the US Virgin Islands, Gulf Coast, Hawaii and California, Pacific Northwest and Alaska, and the Great Lakes Region. Each section covers information about each lighthouse, including personal stories. I LOVE cookbooks that are more than recipes - this one relays history, stories, and recipes all in one gorgeous book. There are line illustrations for each lighthouse, and a set menu. For the fall supper at the Portsmouth Harbor Lighthouse, you'll find recipes for Corn Chowder, Mashed Turnips, Baked Butternut Squash with Cranberries and Maple Syrup, Roast Striped Bass with Onion and Fennel, and Upside-down Apple Pandowdy. At the Haceta Head Lighthouse, you'll find a breakfast menu of Yogurt Fruit Frappe, Sailor's Bread with Fresh Seasonal Fruit, Fruit and Juniper Grover Farm's Tumalo Tomme, Chive Crepes with Smoked Salmon and Hand-Packed Ricotta Cheese, Spinach, Kale, and Juniper Grover Farm's Feta Frittata, and Sudan Farms Greek Lamb Sausage. Here's a video and recipe from the authors of the American Lighthouse Cookbook - YUM! This is a brownie-like cake that’s great for anyone with a sweet tooth. 1. Preheat the oven to 325ºF. Butter 2 (9-inch round) cake pans with 1 tablespoon of butter. 3. Melt the chocolate in the microwave on medium heat. 4. In electric mixer, cream together 8 tablespoons of butter and sugar until fluffy. Add the eggs, 1 at a time, beating well after each addition. Pour in the vinegar and melted choco¬late, and mix well. 5. Slowly add the flour mixture, mixing until fully incorporated. 6. Spread the batter into the prepared cake pans. 7. Bake 30 minutes, or until an inserted toothpick comes out clean. Do not overbake. 8. Unmold the cakes. Place 1 layer so the bottom is facing up on a platter. Spread ¼ cup of Cocoa Frosting on top of this layer. Place the second layer on top so the bottoms of the layers are together, and frost the entire cake with remaining Cocoa Frosting. 1. In an electric mixer, stir together the sugar, butter, vanilla, and cocoa. Add the milk, a little at a time, until the desired consistency is achieved for the frosting.